Higher resolution: Plasma display devices have higher resolution than most conventional TV sets, and are capable of displaying full HDTV and DTV signals as well as XGA, SVGA and VGA signals from a computer. For example, a plasma display with a 1024 x 1024 pixel resolution can display images from 1080i and 720p HDTV resolution, as well as 480i and 480p HD signals. No scan lines: Plasma screens have no scan lines due to the fact that each and every pixel cell has its own transistor electrode. This creates a smooth evenly lit image across the entire surface of the display. Most current plasma displays also include built-in line doubling to improve image quality from low resolution video signals. Conventional CRTs use an electron beam to scan the picture tube from top to bottom at regular intervals, lighting the phosphors to create the image. With standard (NTSC) TV, visible scan lines can be seen. Exceptional color accuracy: High-end plasma displays are capable of displaying 16.77 million colors providing superb color realism with exceptionally subtle gradations between colors. Color saturation is one of the most poignant factors elevating plasma screens over other display technologies. Widescreen aspect ratio: Plasma display devices have a widescreen 16:9 aspect ratio, which states the dimensional relationship between the screen's width and height. This is the proper aspect ratio for HDTV viewing, and is also the best aspect for DVD replay. What happens when viewing a regular TV or computer image? Does the image look stretched? There are several aspect ratios which plasma displays use to size the incoming video image. All plasma screens can show the image in its original 4:3 format with bars (either black or gray) on the sides of the image. There can be some variation among plasma screens in how well they convert a 4:3 image to the widescreen monitor. Manufacturing engineers accomplish a best of all worlds approach by limiting the stretching in the center of the screen and also by enlarging the entire image size to larger than the screen size. This scaling technique allows the most stretching to be located on the sides of the image thus reducing visible distortion. So the answer to the question is that a viewer may watch the image on the plasma screen in a variety of ways when displaying an incoming "normal" or 4:3 picture image from satellite, VCR, or cable TV. It can be displayed as is with the bars on the sides. In Zoom mode the image will have very little distortion or stretching and will fill the entire screen area. However, this mode usually is not favorable because it cuts off too much of the picture image and also because it causes motion artifacts and pixelation, or grainy appearance. The 16:9 aspect option will not be the preferred method of converting a 4:3 image because it will be the most visibly stretched and distorted of all the options. Uniform screen brightness: Unlike some rear and front projection televisions that suffer from uneven screen brightness seen as "hot spots" in the middle of the screen or a darkening near the edges and especially corners plasma displays illuminate all pixels evenly across the screen. This gives plasma displays their "smooth" appearance. Slim, space-saving design: Plasma display monitors are only a few inches in depth, providing installation options never before possible. Depth is usually measured at around 3.5 inches on 42" displays and 4" for 50" screens. In addition to stand mounting, they can be hung on a wall or from a ceiling, allowing you to enjoy big-screen impact from a component that doesn't dominate floor space. Conventional CRT's, DLP TVs, and rear projection TVs take up far more space and are much more limited in placement flexibility. wide viewing angle: Plasma displays offer a viewing angle of 160 degrees (top to bottom and left to right) much better than rear projection TVs and LCD displays. This allows a larger number of viewers to enjoy proper image reproduction from a wider variety of locations throughout the room. Universal display capability: Most plasma monitors can accept any video format. Typically, they will include composite video, S-video and component video inputs, plus one or more RGB inputs to accept the video input from a computer. The composite video inputs are NTSC, PAL, and SECAM compatible, and are equipped with standard RCA or BNC jacks. How Do Plasma Televisions Work? 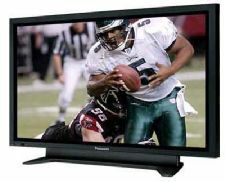 About the Best Selling Plasma Television Models PlasmaTVBuyingGuide's Top 10 Plasma TVs reflects the activity of the leading online plasma TV stores. The Top 10 Plasma Television listings tell you which models are selling most frequently using data compiled from online vendors.